Sub reports were one of the most confusing things to me when I started out with myEvolv. They represent one of the best ways by which you can pull data that is already in the system onto your event forms but they are also one of the parts of myEvolv that are frustratingly limited. Knowing how they work and their limitations can save you some headaches when you go about configuring forms. 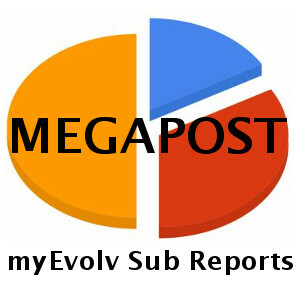 This post will be an attempt to layout everything I know about sub reports in myEvolv. As with all MEGAPOSTS, I will update this post with new information as I come across is. If you have any additions, corrections or elucidations, please send them along! Sub reports are used to pull data that is already in myEvolv onto forms. In the form designer, you can add a UDF Report to any form as a method of displaying relevant information from other areas of the system. Some basic examples of when you might use a sub report are to list a person’s active diagnoses, allergies or demographic information that is fairly static. You might also have sub reports that are more dynamic and pull in service notes for a date range based on fields on the form. All sub reports in myEvolv are based on views that were created by Netsmart, therefore you cannot pull data from user defined fields into a subreport because your user-defined fields are not known by Netsmart and were not included in the select statement that generates the view. In other words, none of the views available for sub reports include any columns from an _x table, where your user defined columns live. This turns out to be a very annoying limitation but one that you can sometimes get around if you don’t mind re-purposing Event Log fields. My post on How To: Filter Activity Type and Encounter With Picklists gets into this a little bit and I will post more about where I have used this in upcoming posts. Another thing to keep in mind with subreports is that there is no security applied to the data that pulls in on the sub report besides the customization that you put into the report. It is therefore possible for users to see data for clients that they are not assigned to through sub reports. Be careful that you are only pulling in data that the end-user should be seeing when you use a sub report. This area will allow you to see all of the system sub reports that exist. These are the sub reports that are used on default system forms throughout the system. You cannot delete or create new system sub reports. You also cannot modify any of these sub reports and because of this, you also cannot see what additional Report Fields are available without creating a User Sub Report based on the same Data Source. This area is where you can view and edit user defined sub reports. The Select Sub Report picklist for this formset member will only show the Report Name and the Report Code, both of which are set by the user. When you create a user defined sub report, as when you create new user defined database fields, it is recommended that you use a prefix like ‘udr’ to distinguish it from system sub reports. The reason for this is avoiding name collisions in the event that Netsmart adds a new system sub report with the same name. The trick with creating a new user defined sub report is finding a view that contains all of the columns that you would need for your sub report, again keeping in mind that you will not have access to anything in a user defined column. 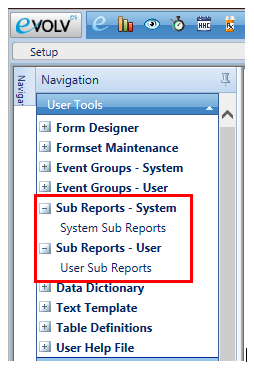 Since you cannot see all of the report fields available for each data source in the System Sub Reports area, you will either need to create a user defined sub report for each data source to see all of the columns available or if you can link to your database with Crystal Reports, you can check out all of the views to see what columns are included in each. User Report Name and User Report Code are editable so you can rename and recode your report as you like. Remarks are useful for keeping notes about what the sub report is designed to do so I strongly using it. The SQL Code field allows you to add some customization to the SQL that is used to pull data into the subreport. From what I can tell, the SQL that you enter into this field executes as though it is the search condition of a WHERE clause in the SQL statement. This allows you to filter the results in a multitude of ways. 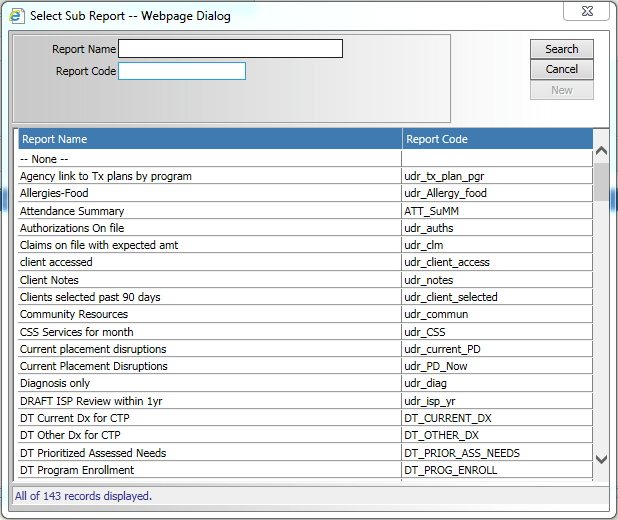 For example, a sub report related to services for a client would pull in all services for the client regardless of program so you may want to filter for a specific program. You can do that by using program_name = 'My Program' in the SQL Code box. You might want to be more specific and select only services of a certain type so you could use event_name = 'My Service'. You can create filters on any of the Report Fields available in the view and you can add complexity using AND and OR operators. This sub form allows you to customize the look of the sub report on the form and also allows you to do some more filtering of the data based on the parent form fields. The Column Name is used to select which columns from the data source will be used in the subreport. When you click the build button for this field, you will be able to see all of the columns that have been included in this view by Netsmart. These are all of the columns that you can include in the report. The picklist popup will show you the column name and the data type for the column. 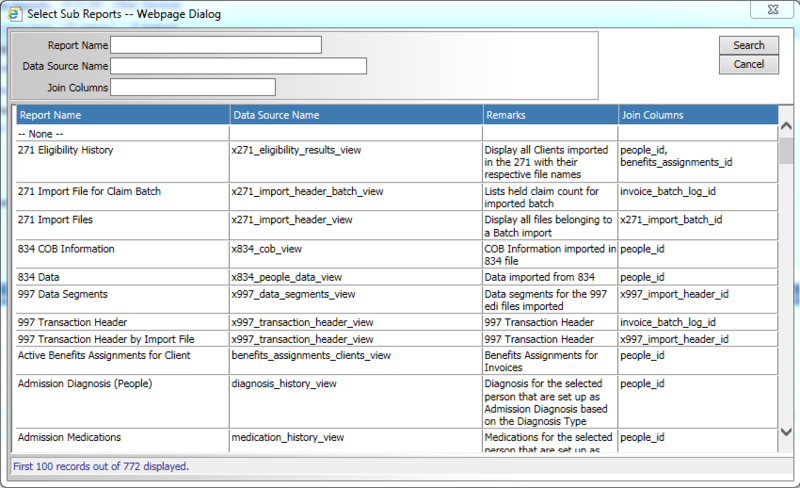 Many of the columns that are included in the views are uniqueidentifier data type. These are the GUIDs that are used for primary keys in myEvolv’s tables. These are not useful to be displayed but come into play if you want to filter data through a join. The Data Type allows you to display the data from the column in a different format. For the most part, you will want to display the data in your sub report using the same data type that the data is stored in. One place where this might be different is displaying a DateTime as Date Only if you do not wish to display the time. The Caption allows you to determine the column header on the displayed sub report. The Field Order allows you to determine the order that the columns render in the sub report table. If this box is checked, the subreport will be sorted by this column in ascending order. If more than one column has this box checked in the subreport, the columns will be ordered in priority based on their Field Order. If this box is checked, the sort will be in descending order rather than ascending order for this column. If this checkbox is checked, the column will display in the sub report on the form. When this box is checked, the sub report will filter based on the value of this field on the parent form. For example, if people_id is included in the sub report and used as a Join Field and this sub report is used on a form that has a people_id field on it, the sub report will only select rows from the view where the people_id‘s match, effectively filtering the sub report to display only data for the client that the form is for. people_id is a commonly used EventLog field on activities for people and is often configured to default to the value for the client whose record is selected. This field allows you to designate a different form field from the parent form to join on. If you simply check the Join Field checkbox, the sub report will look for a parent form field that matches the sub report form field. Instead, you can designate a different field here. As an example of where this might come into play, say you have a monthly summary event where the summary’s actual_date will be the month after that being summarized. The actual_date on the parent form will be June when you are summarizing May’s services. In order to filter the sub report to May’s notes, you will not be able to simply use actual_date as a Join Field since that would pull in June’s notes. Instead, you would add another date field to the summary (for example udf_summarized_date and then use it to overwrite the form field to join with the sub report’s actual_date. The Operator allows you to choose a different operator to use with your join. By default, the operator is equal. You can use this to filter a sub report with a join on a date field using greater than or less than to get entries that occurred before or after a date field on the parent form.